Here comes the 28th RG European Championships, competition will start on Friday, and end on Sunday. Zhenya will compete for AA on Saturday. This year (on even number year) No EF, only AA for senior individual and EF for junior individuals and senior groups. Good Luck to Zhenya !!! Wish Her All the BEST!!! 小兔寶加油!!! Davai Davai!!! This entry was posted in Event, Slide Show. Bookmark the permalink. I added more photos to slideshow-95 photos now. Good girl Zhenya! Good girl!!! keep going, we all pray for you!!! By her words, there is participation in OG ahead, and she is not going to relax before upcoming competition. Absolutely deserved! Hoop and ball were brilliant!! BRAVO ZHENECHKA! I’m so happy for her!! Thank you for sharing all this information! It is great to be able to watch. Zhenya’s hoop AA-EC 2012-the rite of spring is back! ohhhh I was worried for few weeks!!!! because I knew the changes of music before EC…T-T now finally I am relieved, thank you Zhenya and Congratualtions for your victory in EC 2012!!! Zhenya I am sooo proud of you, it’s really difficult for you, with 2 new rouitnes music and you overcome. Big Big Congratulations!!! 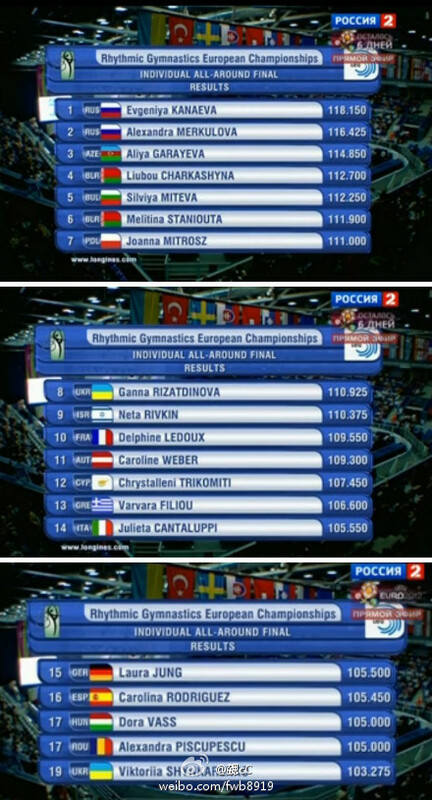 3 consecutive European AA Champion Evgeniya Kanaeva!!! Note that the finals of these 28th European Rhythmic Gymnastics Championships will be produced by the Russian television RTR and broadcasted by the following TV channels: FIYLE (Finland), GRERT (Greece), ITRAI (Italy), SIRTVS (Slovenia) and TRTRT (Turkey). Oleg Naumov just uploaded some training photos, the ribbon color looks really beautiful ❤ I inserted EC photos slideshow to this article. I read Bulgarian TV BNT2 will broadcast this competition. I hope she performs at her best! I’m also very curious to see her compete in her new leotard(s). I like the pink and green one (it reminds me of a flower with leaves) though I agree it might not fit the Chopin routine but we shall see. Being a bit bored of her blue one with the big white front panel anyway.. 😉 haha, I’d like to see her wear a new outfit, but of course it is secondary to everything else. It would be fun if the fans could vote for the costume!